Anne Gros, the only daughter of François Gros, has established a solid character and reputation in the wine world after taking over her father’s domaine in 1988. At 25 years old, Anne saw the family domaine grow from 3 to 6.5 ha. Recently, she invested in a new cellar. She is a winegrower suspicious of certitude and fastidious about maintaining her freedom. As a woman winegrower, Anne knew how to prove herself and convince all who doubted of her ability to manage a domaine. She showed that she had not only the shoulders but the head to make her family heritage one of the greatest domaines of Burgundy. In 1984 she had to stop studying Arts to study vines’culture and oenology in Beaune and Dijon. Now her passion for vine and wine as well as her talent, sensitivity and professionalism posit her as a winemaker amateurs can rely on. Mother of three children, Anne spends all her time working at the Domaine and taking care of her family. Bourgogne Hautes-Côtes de Nuits, 2012….Their most important holding – 4h but only half in production now – from 50+ yr old vines above Vosne. Bourgogne Rouge, 2012….From three small parcels in Pommard and another in Volnay – blended together so declassified by law. Chambolle-Musigny, 2012…..From five small parcels – about half a hectare in total. Savigny-lès-Beaune 1er Cru Clos des Guettes, 2012…..0.5h a south-facing enclosed vineyard from massal-selected vines planted 70+ years ago. 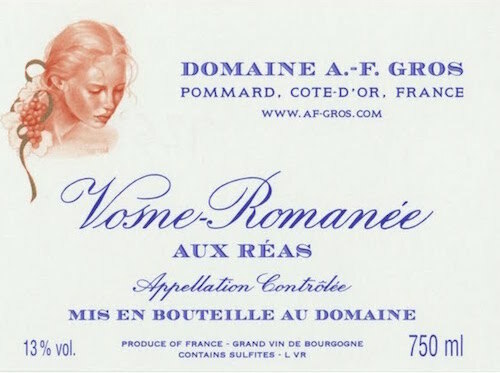 Vosne-Romanée Aux Réas, 2012….Their CALLING CARD – 1.7h – their largest holding in Vosne: just above the village. Vosne-Romanée Clos de la Fontaine Monopole, 2012…..Sole owner of this Monopole – a former garden until 1988 when planted with massal selected vines from their Richebourg plot. Pommard 1er Cru Les Pezerolles, 2012…..80% of 1h lost to hail – tiny production – next to Clos des Mouches. Richebourg Grand Cru, 2012…..90 yr old vines – all one plot 0.7h – nectar.